Chokgyur Dechen Shikpo Lingpa (Tib. མཆོག་གྱུར་བདེ་ཆེན་ཞིག་པོ་གླིང་པ་, Wyl. mchog gyur bde chen zhig po gling pa) (1829-1870) — one of the great tertöns and an emanation of Prince Murub Tsenpo. He was a contemporary of Jamyang Khyentse Wangpo and Jamgön Kongtrul, and, like Khyentse Wangpo, was entrusted with the seven special transmissions. His terma revelations – the Chokling Tersar (New Treasures of Chokgyur Lingpa) – include the Tukdrup Barché Kunsel, the Zabtik Drolchok, the Lamrim Yeshe Nyingpo, the Seven Profound Cycles, and the Three Classes of the Great Perfection. Profound teachings meant for our times, his revelations are known for including practices that are both concise and easy to apply. Chokgyur Lingpa was born in Sangyal (Tib. gsang rgyal; Eng. Secret Victory), at the base of the sacred mountain Namkhadzö (Tib. nam mkha’ mdzod, Eng. Sky Treasury) in the province of Nangchen, on the tenth day of the sixth month of the female earth ox year (August 9, 1829). 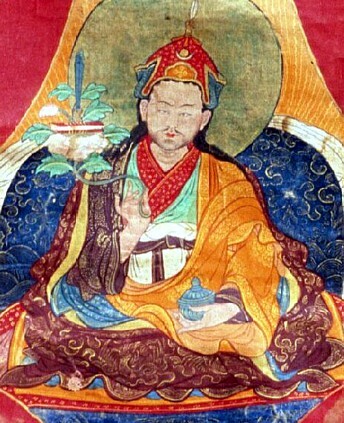 It is said that Chokgyur Lingpa was the final reincarnation of Prince Murub Tsenpo, second son of the Dharma king Trisong Detsen. Considered in his lineage as the last of the hundred major tertöns, Chokgyur Lingpa is regarded as the tertön meant for our times, with teachings particularly potent for our day and age. Indeed, one of the unique features of his revelations is that they include many short practices that are easy to apply and understand, making them well suited to our busy times. Will bring honour to the teachings in degenerate times. They will be profound and vast in reach, spreading further than sunlight. The king and son mentioned here are Trisong Deutsen and Murub Tsenpo, who were reincarnated respectively as Jamyang Khyentse Wangpo and Chokgyur Lingpa. Indeed, throughout his activity as a treasure revealer, Chokgyur Lingpa was closely associated with the two figures at the forefront of the non-sectarian Rime movement that flourished in Kham in the nineteenth century – namely Jamyang Khyentse Wangpo and Jamgön Kongtrül Lodrö Thaye, both of whom participated in many of his treasure discoveries and writings. These three masters were all related as teacher and disciple, each regarding the other two as gurus. Chokgyur Lingpa passed away in 1870, having ascended from anonymity to great renown as a treasure revealer in his short life-span of forty-one years. After his passing, Jamyang Khyentse Wangpo had a vision in which he saw Chokgyur Lingpa as the bodhisattva Pema Nyingpo (Tib. ‘’padma snying po: Eng. ’’Lotus Essence’’) in his own newly-created pureland ‘’Pema Khebpé Shyingkham’’ (Tib. ‘’padma khebs pa’i zhing khams’’; Eng. ‘’the Lotus-Covered Realm’’). The lineage of his revelations, the Chokling Tersar, the ‘’New Treasures of Chokgyur Lingpa’’, has been unbrokenly transmitted by the many great masters who have been his lineage holders, and also by his family line and line of reincarnation. The Chokling Tersar is still widely revered, and is practiced today in various monasteries in India, Tibet, and Nepal. ↑ According to Tulku Thondup, a great tertön is a treasure revealer who has discovered teachings related to three categories of practices: Guru Rinpoche, Avalokiteshvara and the Great Perfection. In Hidden Teachings of Tibet: An Explanation of the Terma Tradition of the Nyingma School of Buddhism, 71. ↑ Murub Tsenpo was prophesied to take rebirth as a tertön 13 times, the last one being his incarnation as Chokgyur Lingpa. Thus, in his biography of Chokgyur Lingpa entitled Breeze that Carries the Auspicious Melody, Jamyang Khyentse Wangpo quotes the following prophecy taken from one of Chokgyur Lingpa’s Treasures, the Basic framework for the Sadhanas of Profound Auspicious Coincidence (Tib. rten ’brel zab mo'i sgrub thabs mdo chings), which is understood to concern Chokgyur Lingpa: “The profound Treasures concealed in Sky Treasury / Will not remain there, but will be revealed by a man with aspirations. / Lhasé, this will be your last incarnation.” Jamyang Khyentse Wangpo, The Breeze that Carries the Auspicious Melody, in The Great Tertön, 264. ↑ Though many tertöns have appeared since Chokgyur Lingpa, the latter is considered within his lineage as the last of the major tertöns. This claim is supported by various prophecies as well as the statements of certain of Chokgyur Lingpa’s contemporaries. Thus contemporary lineage master Orgyen Tobgyal Rinpoche explained: “In all the major chronicles of Padmasambhava’s life, in which he gives detailed predictions for the future, Guru Rinpoché announces that Chokgyur Lingpa will be the last of the hundred major tertöns to appear for the benefit of beings. Jamyang Khyentsé Wangpo has said that, as last in the line, Chokgyur Lingpa’s dharma activity to benefit beings cannot be matched by that of all his predecessors added together.” In The Great Tertön, 163. ↑ Indeed, once treasures are revealed, often in crypted form, they need to be decoded and written down. Jamgön Kongtrül and Khyentse Wangpo assisted Chokgyur Lingpa greatly in this task, as shown in his biography, The Breeze that Carries the Auspicious Melody. Jamyang Khyentse Wangpo, The Breeze that Carries the Auspicious Melody in The Great Tertön, 253-324. ↑ In The Great Tertön, 309. ↑ In Nepal, the New Treasures of Chokgyur Lingpa are mainly practiced in the monasteries of Shechen and Ka-Nying Shedrub Ling as well as the nunnery of Nagi in Kathmandu, and in the region of Nubri. In India, they are mainly practiced in the monastery of Pema Ewam Chögar Gyurme Ling in Bir. In Tibet, they are still practiced at Chokgyur Lingpa’s main seats, namely, the Neten (Tib. gnas rten) and Kela (Tib. ke la) monasteries in Kham. ↑ In The Light of Wisdom, Vol. I, 286. Doctor, Andreas. Tibetan Treasure Literature: Revelation, Tradition and Accomplishment in Visionary Buddhism. Ithaca: Snow Lion, 2005. Dudjom Rinpoche. The Nyingma School of Tibetan Buddhism, Its Fundamentals and History. Trans. and ed. Gyurme Dorje. Boston: Wisdom, 1991, 841-848. Lhasey Lotsawa. The Great Tertön. Kathmandu: Lhasey Lotsawa, 2018. Nyoshul Khenpo. A Marvelous Garland of Rare Gems: Biographies of Masters of Awareness in the Dzogchen Lineage. Junction City: Padma Publications, 2005, 431-435. Orgyen Tobgyal Rinpoche. The Life of Chokgyur Lingpa. Rangjung Yeshe Publications, 2000 (see External Links below). Tulku Urgyen Rinpoche. Blazing Splendor: The Memoirs of Tulku Urgyen Rinpoche. Boudhanath, Hong Kong, Esby: Rangjung Yeshe Publications, 2005, Chapter. 5, 'My Great Grandfather, The Treasure Revealer'. This page was last edited on 26 June 2018, at 18:25.